Don’t forget that today marks the start of our 30 days of Healthy Living (30 Day Shred). Check in at the end of the day for that extra push of accountability. I have uploaded a calendar for your use. It’s about saving with a vision. Setting goals, getting out of debt, and building an emergency fund (to name a few) are all important steps to take so that ultimately, you can save and then spend wisely, and give generously. With that thought in mind, it’s my privilege to partner again as one of Savings.com’s Deal Pros in spreading their vision for saving money – not just any amount, but a combined total of ONE BILLION Dollars. Yes, it’s called the Savings Pledge, and so far, we have pledged $4,600,000 dollars towards a savings goal, but they want to keep it going. I would love to have you think in your mind, what you might be able to save weekly. Remember, when I discussed budgeting, I shared it’s about giving every dollar a job. Dollars are told what to do, and every dollar in our budget needs to have a task. There’s such freedom in understanding and figuring out what that means for your family. This is going to be one of those times when you tell these dollars what to do and how they are going to work for you. 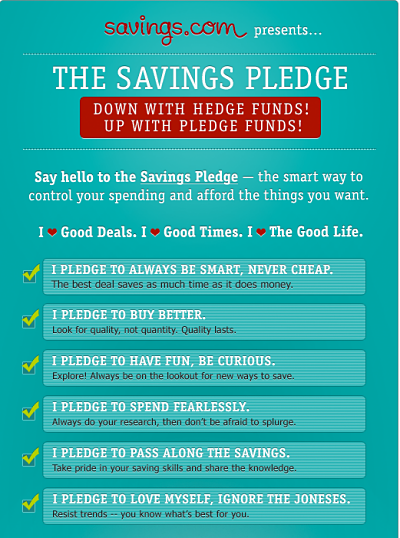 That’s why I love this Savings Pledge. It’s not just about scrimping and sacrificing. Yes, you may have to do that as well, but it’s being smart and making wise choices about spending money on the things you need in order to be able to afford the things you want. Join me over at my Facebook page to make a commitment about being smarter with your money. When you take the pledge, you specify the amount of money you plan to save weekly, how you plan to attain that goal and what you are saving for. (This is low pressure, you just pick from their box choices. It takes about one minute.) Everyone’s goals are going to vastly different, but whether it’s a down payment on a house, dream vacation, or just climbing out of debt, we want to provide users with the tips and tools necessary to achieve their goals. There isn’t a place to share your goals over on my Savings pledge facebook section, but if there’s something you are saving for now, I’d love to hear it. Sometimes it’s just so fun to encourage each other in the journey.